You can use Ultimate Watch 2 to control other devices such as your smart home, smart lighting, home cinema, your car etc directly from your watch. It has support for IFTTT, Tasker as well as general cloud webhooks. ​You can use Ultimate Watch 2 to control other devices directly from the watch. You control these devices by configuring shortcuts on the dials that triggers an action when you tap on them. There are 3 different ways on how to control other devices. 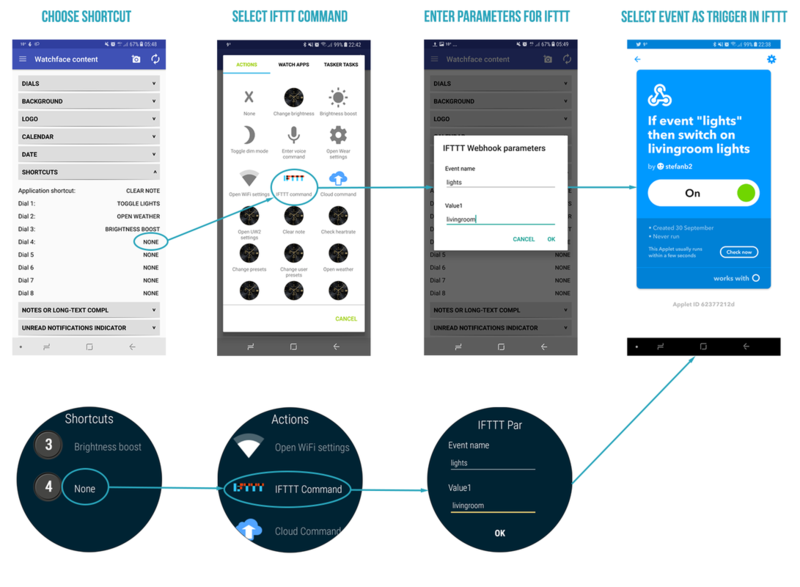 ​The easiest way to start automation of other devices from the watch is to use IFTTT. It has support for hundreds of services that you can control from the watch. You use IFTTT shortcuts on the watch to trigger different types of actions from IFTTT. The IFTTT shortcut becomes the "If" part of the IFTTT applet, and then you can use any of the connected services as the "Then" part. Before you can use IFTTT command shortcuts, you need to store a unique IFTTT key so that IFTTT knows that the commands are coming from you. You get the key by logging in to IFTTT and then go here to generate the webhook key. It will be a long series of letters and numbers. You then need to store this key in Ultimate Watch 2 ( you only have to this step once). You can do this either from the Android phone app or from the watch itself. Please see the screenshots below on where to put the key. *) Note that if you use the watch to enter they key you might have to download an external keyboard to be able to enter the special letters in the key. To configure the IFTTT shortcuts you use the same method as any other shortcut. Just follow the procedure below. Use the event name to identify the webhook in IFTTT. ​You can also control other devices using generic cloud URLs (webhooks). Most automation software as well as many Internet of Things devices support webhooks in the form of generic http(s) URLs that you can use to connect to these devices. You configure cloud commands in much the same way as the IFTTT shortcuts but you choose Cloud commands instead of IFTTT commands. You then enter the URL to the device or cloud software you want to communicate with. The URL will be submitted using HTTP GET and may contain a query string with parameters to pass to the device. ​If you use an Android phone you can configure Tasker shortcuts that will execute Tasker actions on the phone. In the shortcut selection dialog you swipe to the Tasker tab and select the Tasker action to execute when you tap on the dial. Ultimate Watch has support for automation using IFTTT, Tasker, AutomateIt, Automate etc. You can use these apps to automate different tasks in Ultimate Watch 2. Control Ultimate Watch 2 from Google Home, Google Assistant or Alexa. For example you can order Google Home or Alexa to change watchface. You can also automate in the other direction by assigning tap shortcuts on the dials on the watch to initiate Tasker actions on the phone. You can for example use this to control your smart-home from the watch or create remote controls. Note that you currently need an Android phone and have the Android Ultimate Watch 2 phone app installed to use automation. If you want to quickly try automation with IFTTT, here are a few IFTTT applet examples. Before you start, just make sure that you have enabled notification access as described in step 1 below and make sure that you have the Android IFTTT app installed. You initiate actions on Ultimate Watch 2 by using the automation apps to send an Android notification with a command to Ultimate Watch 2. Ultimate Watch 2 will then intercept these notifications and send the command to the watch. Once you have enabled notification access you can start building your automation jobs. Please see the documentation for the automation app you are using to learn how to send a notification from the app. Taking IFTTT as an example you first define the trigger that will initiate the action (the IF part) and then as the THAT part you select to send a notification. Then as the text of the notification you write the Ultimate Watch 2 command as described below.